4'X6' ThermaFur Heated Fleece Blanket USES 8 Heat Pax brand warmers to stay warm and comfy for up to 24 hours. One set of Heat Pax included with each blanket. Color Black. Size 4' x 6'. Radnor� bourbon brown side split cowhide split leg bib apron with crossed back straps for comfort, side release buckle for easy on/off, two chest pockets, reinforced center and side release buckles down legs and metal D-ring on front. 24� x 36� split leg bib apron Two chest pockets Cotton crossed back straps for comfort with side release buckles for easy on/off. 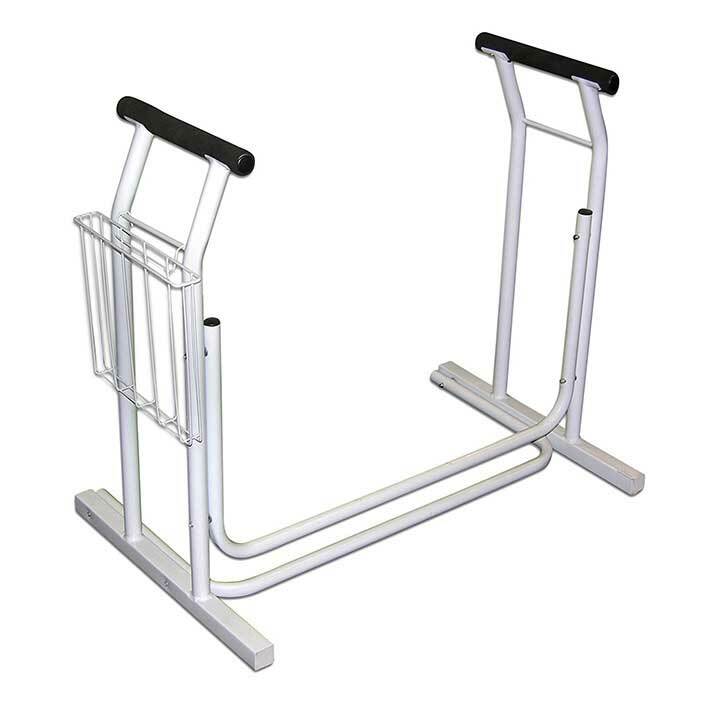 Side release buckles down the legs and metal D-rings on front Sewn with Kevlar� thread Specially tanned side split cowhide provides greater resistance and added protection from sparks and spatter. This item cannot be shipped to APO/FPO addresses. Radnor� bourbon brown side split cowhide bib apron features two chest pockets, cotton crossed back straps for comfort and side-release buckles for easy on and off. 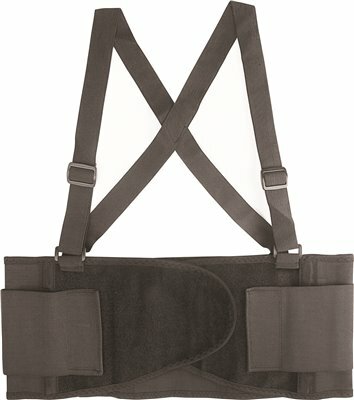 24" X 48" bib apron Cotton crossed back straps Side release buckles Sewn with Kevlar� thread Two chest pockets Specially tanned side split cowhide provides greater resistance and added protection from sparks and spatter. This item cannot be shipped to APO/FPO addresses. Radnor� bourbon brown side split cowhide 15" spring leggings feature bicycle type spring clips that form a sturdy frame around the leg to keep legging in position. 15" high The Bicycle spring type clips allow leather to be tucked into spring steel which forms sturdy frame around leg to keep legging in position Metal insert on top of foot can be shaped to fit over shoe Sewn with Kevlar� thread Specially tanned side split cowhide provides greater resistance and added protection from sparks and spatter. This item cannot be shipped to APO/FPO addresses. 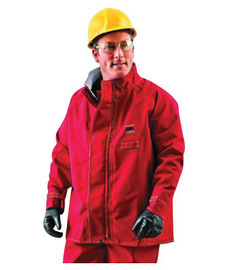 Comfortable Gore� Chemical Splash Fabric Lightweight, flexible, snag and tear-resistant, stain-repellent and washable Chemical processing General industry Petrochemicals This item cannot be shipped to APO/FPO addresses. 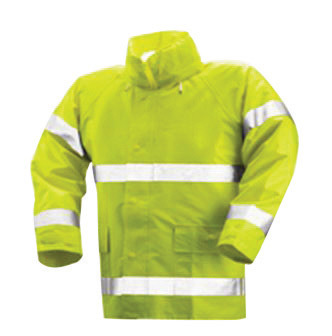 Soapstone pocket on each sleeve 1 Outside Pocket Underarm gusset allows for easier movement Sewn with Kevlar� thread 30" length Specially tanned side split cowhide provides greater resistance and added protection from sparks and spatter. 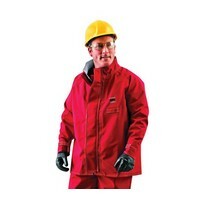 Radnor� Quality Protective Clothing at a very affordable Price. This item cannot be shipped to APO/FPO addresses. Radnor� bourbon brown side split cowhide split leg bib apron with crossed back straps for comfort, side release buckle for easy on/off, two chest pockets, reinforced center and side release buckles down legs and metal D-ring on front. 24" X 48" split leg bib apron Two chest pockets Cotton crossed back straps for comfort with side release buckles for easy on/off. Side release buckles down the legs and metal D-rings on front Sewn with Kevlar� thread Specially tanned side split cowhide provides greater resistance and added protection from sparks and spatter. This item cannot be shipped to APO/FPO addresses. Radnor� bourbon brown side split cowhide bib apron features two chest pockets, cotton crossed back straps for comfort and side-release buckles for easy on and off. 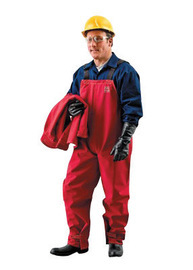 24� x 30� bib apron Cotton crossed back straps Side release buckles Sewn with Kevlar� thread Two chest pockets Specially tanned side split cowhide provides greater resistance and added protection from sparks and spatter. This item cannot be shipped to APO/FPO addresses. Easy solution to help seniors and those with a disability more safe and independent. Includes a handy magazine rack and slip resistant padding at bottom. Can hold up to 3 magazines. Soft foram handles and non-slip feet. 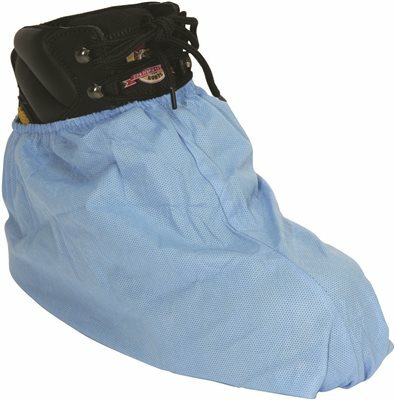 North Gen �Pro� 10" (25 cm) blue SMS polypropylene high boot covers with elastic top. Resistant to noxious dust and splash. One size fits most. 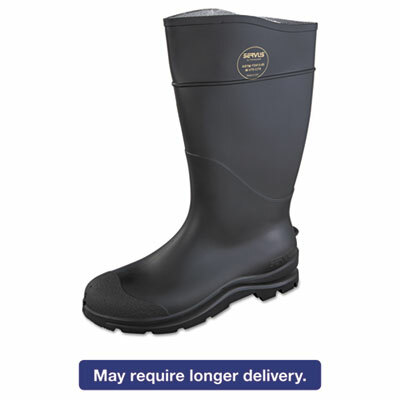 Keep feet dry with 100% waterproof, knee-high work boots. Comfort Technology, with a unique scalloped top-line design, allows comfort no matter how feet flex or move. 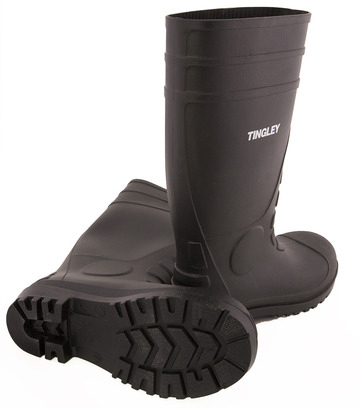 Trac10 outsole design gives boots slip-resistance and increased stability. Contour heel cup molds to heel, reducing slippage for a secure fit. Foot Form contour insoles provide all-day comfort. 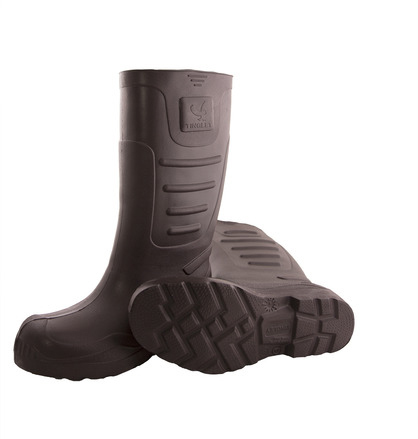 Sleek and contemporary boots are ideal for farm, industrial or occupational work. Footwear Type: Work Boot; Size Group: 11; Material(s): Rubber; Steel; Color(s): Black. 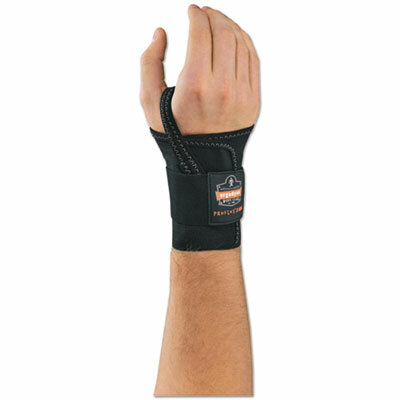 Give injured wrists the support they need, with a single strap support brace that limits downward wrist movement. Designed with a Patented Open-Center Stay�. Three-stage hook and loop closure for security and comfort. Anti-odor treatment ensures a pleasant user experience. Size Group: XL (8"+); Fits: Right Hand; Material(s): Elastic; Color(s): Black. Give injured wrists the support they need, with a single strap support brace that limits downward wrist movement. Designed with a Patented Open-Center Stay�. Three-stage hook and loop closure for security and comfort. Anti-odor treatment ensures a pleasant user experience. Size Group: Large (7-8"); Fits: Left Hand; Material(s): Elastic; Color(s): Black. Give injured wrists the support they need, with a single strap support brace that limits downward wrist movement. Designed with a Patented Open-Center Stay�. Three-stage hook and loop closure for security and comfort. Anti-odor treatment ensures a pleasant user experience. Size Group: Medium (6-7"); Fits: Left Hand; Material(s): Elastic; Color(s): Black. Give injured wrists the support they need, with a single strap support brace that limits downward wrist movement. Designed with a Patented Open-Center Stay�. Three-stage hook and loop closure for security and comfort. 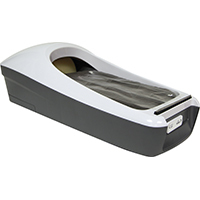 Anti-odor treatment ensures a pleasant user experience. Size Group: XL (8"+); Fits: Left Hand; Material(s): Elastic; Color(s): Black. Keep feet dry with 100% waterproof, knee-high work boots. Comfort Technology, with a unique scalloped top-line design, allows comfort no matter how feet flex or move. Trac10 outsole design gives boots slip-resistance and increased stability. 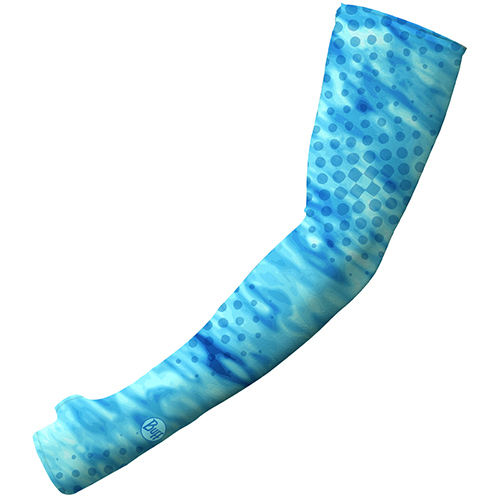 Contour heel cup molds to heel, reducing slippage for a secure fit. Foot Form contour insoles provide all-day comfort. 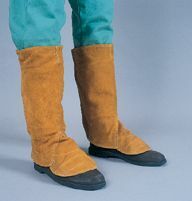 Sleek and contemporary boots are ideal for farm, industrial or occupational work. 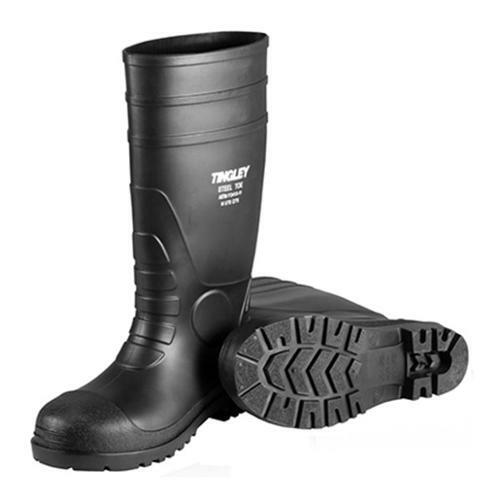 Footwear Type: Work Boot; Size Group: 12; Material(s): Rubber; Steel; Color(s): Black.